Enzo Bonafè: the Art of making the finest Italian shoes. This content is not intended to foster contact requests from people who are willing to start a new shoe business. For more information on how to become a relailer please refer to the following page. Tips on how to start a shoe business of “niche top quality products”. Enzo Bonafe’s managers share their thoughts. The following thoughts have come out from a remarkable conversation with Mrs Silvia Bonafè, who devoted a little of her time to our curiosity and took us to the world of Italian handmade shoes, a kind of niche fascinating and everlasting world. Nowadays the Italian handicrafts are appreciated all over the world and the Italian masters are becoming even more precious in the outline of the excellent Made in Italy manufacturing. Silvia Bonafè’s observations can give very attractive answers to the curious reader while, at the same time, very useful remarks to those people who would like to come into, work and co-operate in this specific “niche” sector. We often use the term “niche” because this word is the best one to express the uniqueness of quality handmade manufacturing, as well as its precious features in the art and fashion scenario. We have tried discovering the niche world of handcrafted shoes, where masters create and take care of shoes made for special customers like connoisseurs or people fond of the Italian Art of designing and making shoes. The main tools of shoe manufacturing are the master’s insight, listening and observation skills. The craftsman’s methods and tools go over times, they do not crash into fashions or tastes. The value of handcrafted shoes is still everlasting, with no rivals, particularly in the present commercial world where you can find lots of mass products, low cost materials, items not forged by the craftsmen’s skilled hands. To some extent, Enzo Bonafè is one of the Made in Italy brands which keep the uniqueness features of shoe craftwork in order to satisfy worldwide demanding customers. Enzo Bonafè’s customers are used to a more sympathetic and direct relationship with the shop assistant or shopkeeper and the company, because their shoes are custom-made, refined and modified in detail. 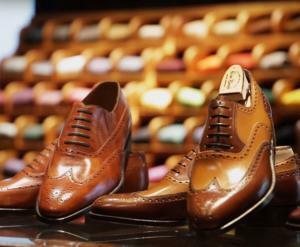 In order to answer the questions repeatedly made by several young people interested in fashion, we have asked Mrs Silvia Bonafè to analyse the main priorities necessary for setting up a shop of handcrafted men shoes. How to set up a shop of high standard shoes? How to set up and run a shop of handcrafted shoes? Silvia Bonafè: Obviously, the chance of increasing important interpersonal relations, plays a decisive role in any kind of business based on the daily relationship with people. As concerns the high quality shoe shops, it is fundamental to show that your interest in the customers’ needs and demands is always true, honest and deep. As a matter of fact, people who want to set up a shoe shop should be more skilled than the usual good salesman. In particular, the resellers who serve international demanding customers must have a special skill to “serve” the customer. The requisites of a good reseller or shopkeeper depend on how he/she listens to the customers, he/she understands their true even indirect requests, and recommends the shoe models which better express their deep character and nature. What are the other main features of a handcrafted shoe shop? Silvia Bonafè: A shoe shop must definitely develop its distinctive identity as any other business. The shop offering unique products must communicate the value of products. The involved sale team should care for its task because the lasting relationship with high class customers relies on confidence. When we refer to the shop identity, we mean features identifying the deep nature of specific products and business; the peculiar brand identity “talks to” all people it is in touch with, from suppliers to workers up to customers. As a result, the identity of a shoe shop cannot be created in one day or one month. The development of your shop identity demands persevering and monitored work thus involving a wide network of people: suppliers, close shops, friends, relatives, personnel. Thanks to these communicating “channels”, the brand, the name and quality of your shop should constantly transfer a deep message. The success of messages raises “emotive responses” so that the customer rewards the shop with his/her loyalty. That’s why a new shoe shop needs a specific identity to be recognised and chosen by customers. Silvia Bonafè’s interview is over. Our time is up. However, we secured a promise from her to have another meeting in order to get more answers to our questions concerning a business or a shop of handcrafted men shoes, like the wonderful and popular shoes made by Enzo Bonafè in Bologna.